Vitamix Standard Programs (Professional 500) compared to Vitamix 5200 - Got Greens? Vitamix Pro 500 vs Vitamix 5200. After the huge success of the Vitamix 5200, Vitamix took blending to a new level with their first blender with pro-program blend cycles, the Vitamix Standard Programs – Pro 500 – 1710 (the same as the Vitamix 6300). The Vitamix Pro 500 blender is now also known as the Vitamix Standard Programs. It is beautiful and has some wonderful added features not found on the Vitamix 5200. For the most part you are getting all the same advantages of the Vitamix 5200. The same 11.5 amp 1380 watt motor, the same 64oz BPA-Free container and the same 7 year warranty provided. The extra goodies that the Vitamix 500 offers have been anticipated by many and welcomed by all. At first glance of the Pro 500 it’s easy to think that you are looking at a metal version of the Vitamix 5200 as it does look very similar except for the shiny brushed stainless steel finish (the Vitamix 5200 is available in white/black/red/platinum). The base design is the same and the control layout is identical but a closer inspection of the panel reveals the distinction. The variable speed dial holds the major difference found in the Vitamix Pro 500; you can now turn the speed dial to the left and choose between 3 preset blending cycles – smoothie, soup and dessert. Also, there is now a separate power switch on the base of the Professional 500. The 5200 on/off switch on the right side is now a start/stop switch and the left side hi/lo switch of the 5200 has been converted to a pulse switch on the Pro 500. The variable speed dial remains in the middle although without the hi/lo switch like the 5200, the dial now includes the full range of Vitamix power, 11 to 240 mph, up to 37,000 rpm. A word about the Pulse feature. The Vitamix 5200 already has a built-in pulse. By turning the variable speed dial up from low and back down quickly you essentially are pulsing and you have complete control over the speed and time at which you pulse. OR set the speed you want and turn the switch on/off. You essentially have a variable speed pulse™ at your finger tips. Another difference found in the box is the support materials, the recipe books and DVDs. While the 5200 Whole Food Recipes book, Getting Started Guide and Let’s Get Started DVD focuses on introducing you to using a high performance blender and how to easily get more whole foods into your diet, the Professional 500 Create Recipes book and Let Get Started DVD focuses more on gourmet cooking and complex recipe creation written by professional chefs. Now the Vitamix Pro 500 sells for the same price as the 5200 – $399 regular price. So it’s pretty much a no brainer. For a better deal consider the Reconditioned Pro 500 (Standard Programs) for $100 less. Vitamix Professional 500 or Vitamix 5200? Thank you all for your comments. They are very helpful for a first timer like me. I have been contemplating on which one to buy. In view of all your comments, I am off to John Lewis now to get myself a vitamix Pro 500. I like the idea of the ‘pre-sets’. I am so happy to hear that we’ve been helpful for you Halima. Congratulations on your decision, enjoy your Pro 500. Hope you don’t mind if I share your blog with my twitter group? There’s a lot of people that I think would really appreciate how the Vitamix Pro 500 compares to Vitamix 5200. Cheers! However, it does not seem to be reflected on their site. Also, will price point be the same as the other colors? If not, what? If not, what does it have? The Brushed Stainless Finish is now available for all 5200 packages. When it was first released it was a unique package. Currently this option is an additional $50. The Vitamix 5200 does have a variable speed dial but it does not go to the maximum speed. To reach maximum speed with the 5200 you need to flip the left switch from ‘Variable’ to ‘High’. In our shopping, it appears we need to buy an extra container @ about $150 if we want to grind whole grains, which we do, if we buy the 5200. It appears the 500 does grains in its original unit. Is this true? Also, how would you compare the K-TEC Champ PH3? 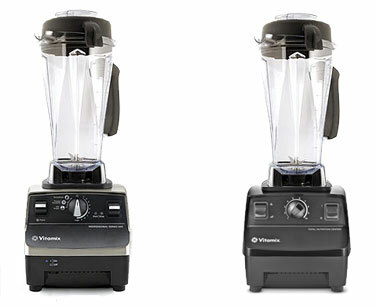 The Vitamix 500 and the 5200 come with the same exact container (the 64oz wet-bade). The standard container that comes with the 500/5200 can grind grains BUT the “dry-blade” container is specifically designed to grind grains and is therefore more efficient at doing so. The dry container’s design also better allows for mixing and kneading of dough. That is why the dry-blade is recommended if you plan on doing a significant amount of grain grinding. With regard to grinding whole grains specifically, it makes no difference whether you purchase the Vitamix Pro 500 or the 5200. The K-TEC Champ HP3 is an old resale version of the Blendtec Total Blender. Some resalers who have warehoused them still have them available. They do not grind whole grains any better than the Vitamix. Hi Judy W. Oh yes this does grains and a very good job at it. Purees them very nicely. As in Peanut butter. Very fast/very smooth peanut butter with a can of cocktail peanuts and a can of honey roasted peanuts, use the tamper and you got nice smooth peanut butter in a matter of a couple minutes. I do use grains. Almonds, sesame seeds. I make my own Tahini. Why buy hummus when it is so easy to make your own!! This Vitamix Pro 500 will pulverize anything you put in it. I went for the Pro 500. I gotta say, it is nice having the dial go all the way without having to swtich to high and the on/off switch is great BUT I don’t like the pre sets very much. I love my Vitamix but if I were to choose again, I would buy a 5200 I think. Hi Jamie! Just purchased the 5200 and am now thinking I should get the 500 because of the presets.Why don’t you like the presets?Also don’t like to change speed to high.Any help would be great. Hi Rosie. I just got the Vitamix Pro 500 and I love it!! The pre-sets are very nice. Smoothie? Turn the dial to “smoothie” and let it run until it stops and your smoothie is done. Same as Soup. Hot soup! Follow the recipe, turn the dial to “Soup” and you can walk away from the machine without a worry. Come back? You got nice hot steamy soup!! The other dial is “Frozen” and I use that alot. It is also a dial you use for raw veggies and alot of smoothies. The fact is? You can Use these pre-sets and let the Vitamix do its thing without having to use the variable. I First heard about these machines, glad I did purchase the Pro 500. Now? I’m hearing of the other ones they have as in the one you have!! LoL .. Seems to me? I made the right choice in which one to purchase and it is worth every penny to me and the 7 yr warranty you can’t beat. Does come with a very nice Recipe book. As big as Betty Crockers!! The CD helps very much. Just need to get used to Which speeds/variables/pre-sets you should use but once you get used to it you can choose to use them or not. I make a blended frappe’ every day!! It’s my “coffee” and I love it. If yours does all you need it to do? Then I would stay it. If you want the pre-sets? Then I would upgrade. Hi All, I am going to buy one of these, i just need HELP deciding. A friend just got one (from memory it looks like 5200) so no-presets, but I thought she just flipped switch & smoothie was made…is that not possible? I will trust you all – just point me in the right direction!! Oh and the self clean feature! THANK YOU!!! The Pro 500 sounds very nice and I would like to have a pulse but I love my 5200 and will probably have it forever.